“It’s kind of fun to do the impossible.”-Walt Disney. My parents were warned I may not live,and I was in a coma. However, I did live and eventually woke up. Now what do I want to do? Well, Ladies and Gentleman a 5K(3.106 miles) because it was believed that I may never be able to do such a thing. Even before I had the massive stroke I had wanted to do a color run. It is a for profit organized run inspired by the Indian festival of Holi(see here)iPerhaps I’m a sucker for gimmicks, but it looks fun and benefits charity From my point of view, Upon finding one near me I signed up and registered, and even getting my Dad to sign up! That is a shining example of the kind of strong support I have. 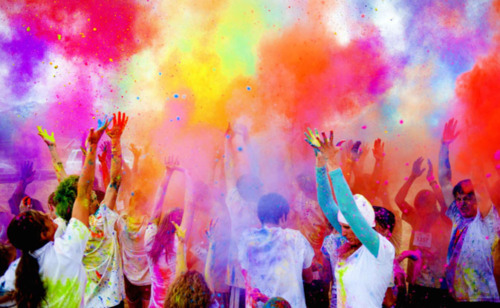 Because my Dad is willing to get covered in colors and even glitter.! I almost didn’t live,had to learn how to walk again,and faced many naysayers. After hearing Doctors and sometimes even therapists tell me what I could and couldn’t do it would have been easy to lose hope or believe them. Except luckily it began to have the opposite affect on me. I was becoming quite the rebellious child. When you so often hear what you can’t do,either a resilience builds up in your soul or a fierce determination makes itself known. While I have always been rather determined, I didn’t know exactly how strong I was until that was the only choice. These days that determination is ever stronger and with a solid streak of rebellion. Because when I’m told I can’t do something, naturally I want to do it. By doing this run(or walk) I wanted to push through the “impossible.” All too often we are told what we can’t do, but what about what we can? I’ve been blessed that for every naysayer I’ve had a friend or loved one that told me the opposite. With love anything is possible. We just don’t hear that enough. So what do you do when people think you can’t walk? The answer is to run a 5K! Pssst enjoy this glam video advertising this years Color Run too!